If you are staying in Thessaloniki and you want to visit the Royal Tombs in the Vergina Museum (with the tomb of King Philip II) and the archaeological site of Aigai (the first capital of the Kingdom of Macedonia), there are a few options to get there. 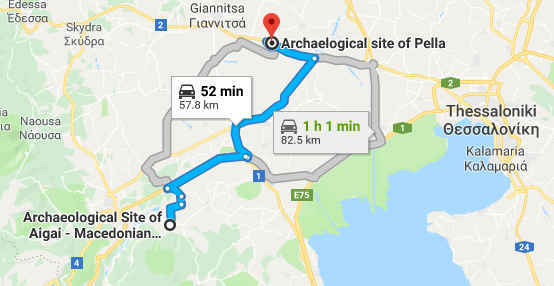 The distance from Thessaloniki to Vergina is about 70 km and the easiest way to get to Vergina is to rent a car in Thessaloniki. This not only offers you the freedom of when to travel, but you can also add some interesting nearby places to your trip like the Edessa waterfalls and the town of Naousa. 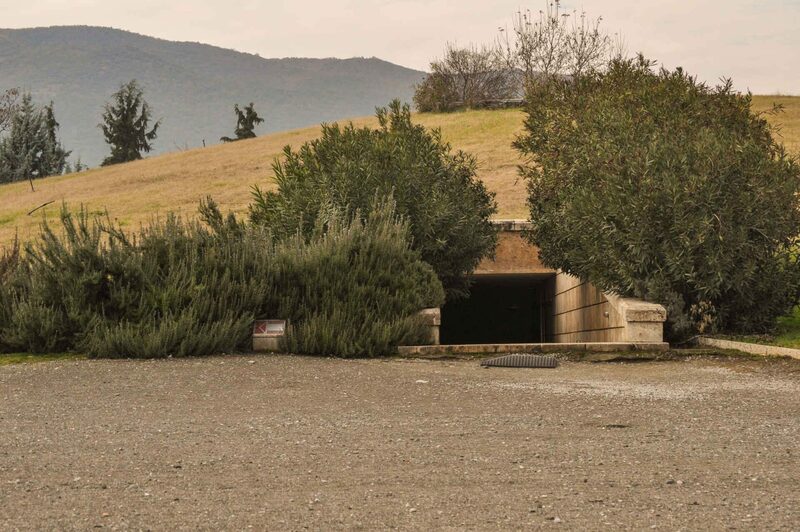 ⇒ Find out more about the Vergina Tombs. The distance and route from Thessaloniki to Vergina. Click to open the full map in Google Maps. If you want to be independent but you don’t have a car, you can take the bus. You have to change buses though in Veroia, as there is no direct connection. Check the time tables below carefully, and be sure to double check the information in Thessaloniki. You could also consider taking the train from Thessaloniki to Veroia to get to the Vergina Museum. The train station of Thessaloniki is in walking distance of Aristotelis Square. More information you will find below. If you prefer an organized tour to Vergina, you can take a look at the tours at the bottom of this page. Most of these tours will not only take you to Vergina, but also to Pella. Pella is the birthplace of Alexander the Great and became the capital of the Macedonian Kingdom after Vergina. In Greece buses are the most popular means of public transport between the Greek cities. Connections between the main Greek cities are operated by the company KTEL (ΚΤΕΛ). This is a cooperation of many regional Greek bus companies. 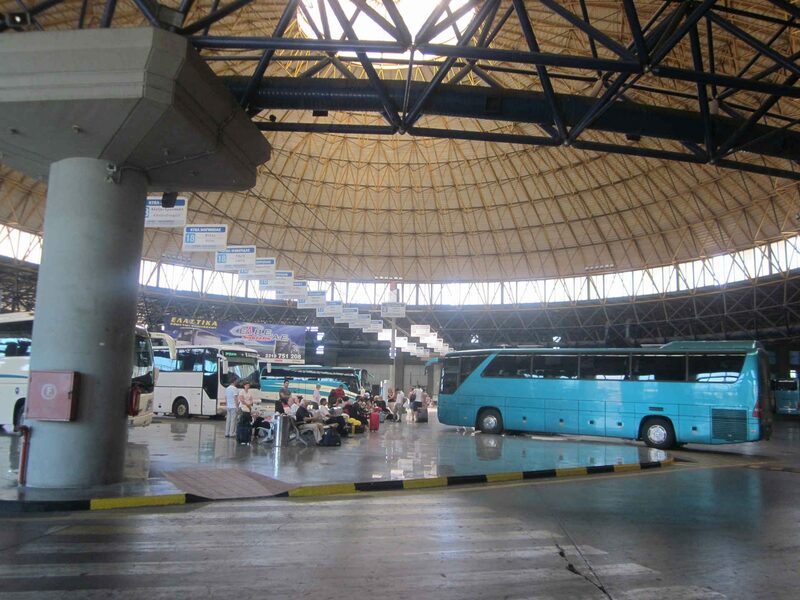 From the centre of Thessaloniki take an urban bus at Egnatia Street to KTEL Macedonia Intercity bus station, which is located about four kilometers outside the center. More easy is to take a taxi. Inside the bus station look for the ticket office that says “KTEL Imathia” (Imathia is the region you have to travel to). Here you can ask information and buy a ticket to the town of Veroia (also written Veria, Beroia and Βέροια). Veroia is a town about 13 km away from Vergina. Ask also from where your bus departs. 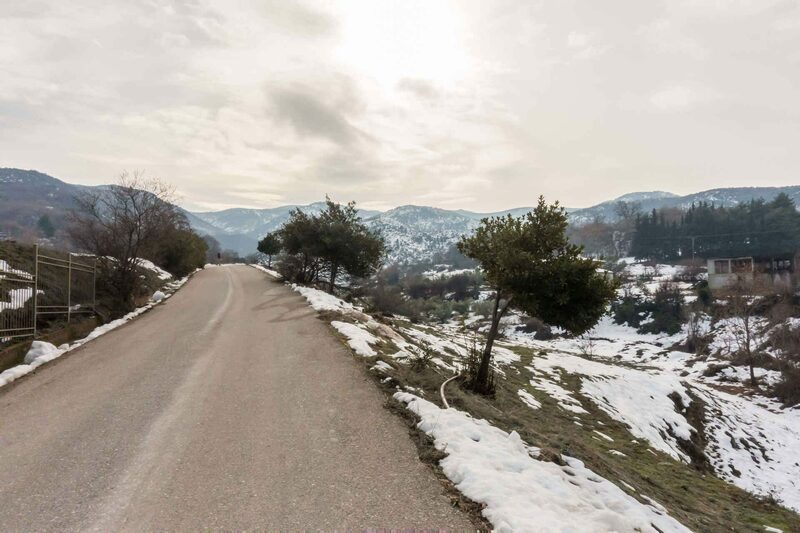 The ride from Thessaloniki to Veroia is about 1h to 1h 30m. The express buses take only 1 hour. Once you arrive in Veroia, take the bus to Vergina, which takes about 20 minutes. The bus stops a small walk from the Vergina Museum of Royal Tombs. Egnatia Road which runs through the center of Thessaloniki. Buses to the central busstation of Thessaloniki you can catch here. Below you will find links to the timetables of the buses. The timetables are in Greek. The first column shows the time of departure, the next columns tell you the days of the week, starting with Monday (Δευτέρα in Greek). Please make sure to double check the times at the bus stations!! Ask at the ticket offices. The time tables in Greece change regularly. 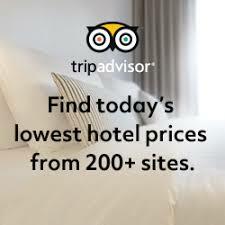 Even information published on the mentioned websites changes now and then, and might be out of date when you arrive. The duration of the trip is about 1h to 1h 30m. Round-trip tickets cost about 11 euros. 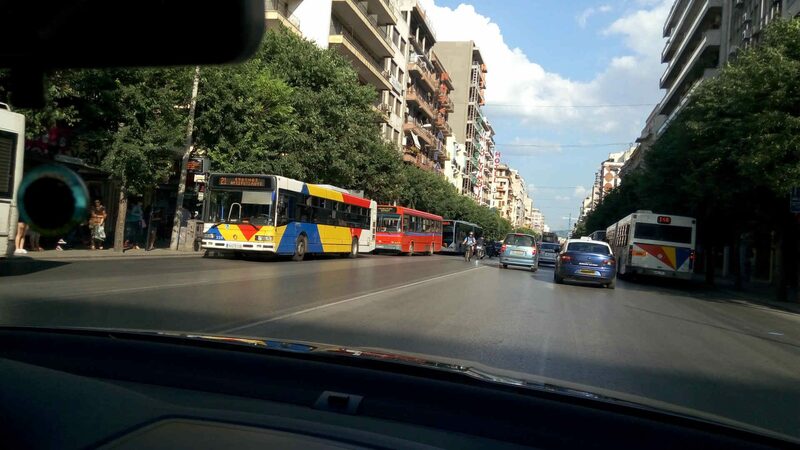 Timetable Thessaloniki – Alexandria – Veroia. Local bus with stops that follows the Old National Road. The duration of the trip is about 20 minutes and costs less than 2 euros. Click on the map to open it in Google Maps. Timetable Veroia to Thessaloniki without stops (express bus). The last ride of the day is with stops. No express bus on Sunday. Timetable Naousa-Veroia-Thessaloniki Express bus except on Sundays, and the last ride. Starts from the town of Naousa. Click on the little “i” to see at what time it departs from Veroia. Timetable Veroia-Alexandria-Thessaloniki via the Old National Road. This is with stops. 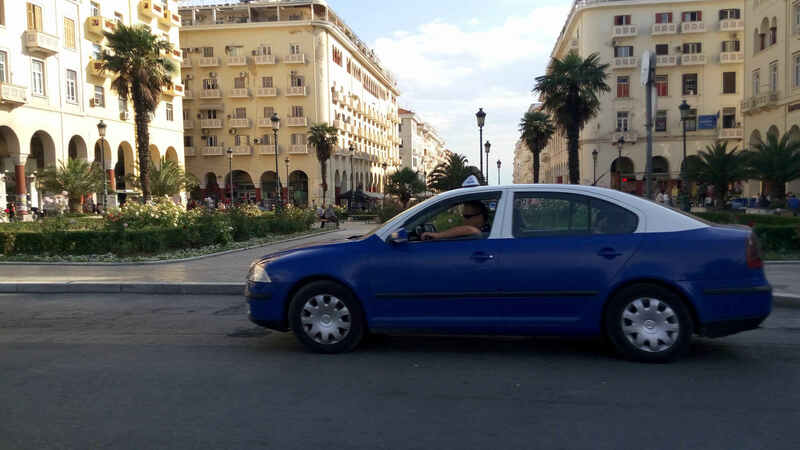 ⟹ Rent a car at the Airport or in the city center of Thessaloniki via Expedia. 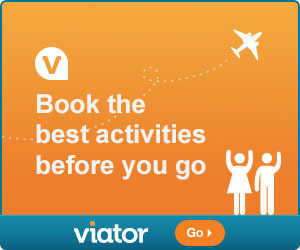 You can choose from many rental car companies. There are two ways to get from Thessaloniki to Vergina by car. Both options take about one hour and have tolls. Via A1 and Egnatia Odos/A2/E90. 69.9 km. 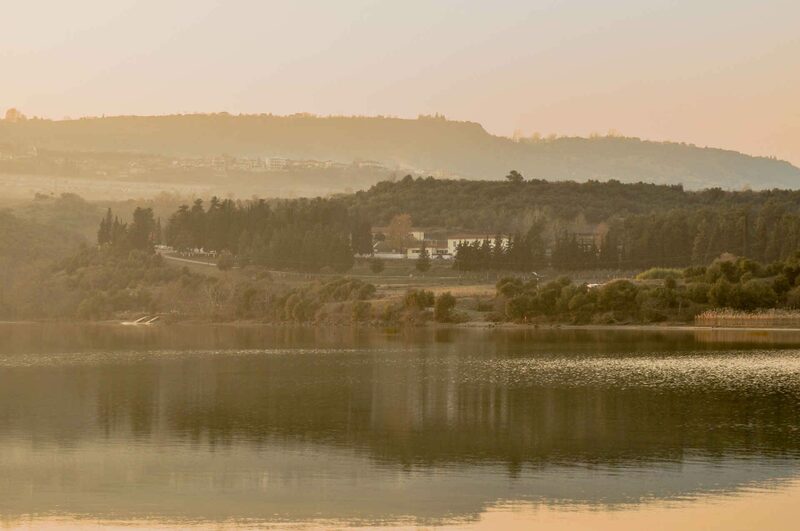 The best thing about going by car is the freedom you have to explore the area, for instance, visiting Lake Aliakmonas. Every day there are a couple of direct trains from Thessaloniki to Veroia. Rides will take about 48 m. to 1 h. 30 m. There are more trains but these require to change trains in a place called Plati, with a waiting time of 15 minutes up to almost 5 hours!! Below we explain where to look for in the timetable to avoid this waiting time. The price of a return ticket is from €4 to €12.50, depending on the sort of train and whether you travel 1st of 2nd class. Note that the train station of Veroia is about three kilometers outside Veroia (Yes Veroia, not Vergina!). It’s located at the plain, while Veroia is built in the hills above. You will first have to get to the busstation of Veroia to catch a bus to Vergina. To get there, you can take either a local bus or a taxi. It’s also possible to take a taxi from the Veroia train station to Vergina. Inform about the costs of the ride beforehand! Timetable trains You can choose English as preferred language. For destination you choose “Thessaloniki” to “Veroia” (written like that). Many trains will show up, but if you look at the first column “duration”, you will see that most of them are not interesting because you will have to wait somewhere for hours. So take a good look at this. For ticket prices see the last column of the timetable which says “Full Cost”. Column “A” shows the ticket price for 1st class, while column “B” shows the price for a 2nd class ticket. Beautiful winter landscape. The road that leads to the palace and the acropolis of Aigai in Vergina. Notice that opening hours of the Vergina Museum and archaeological site differ during winter. There are plenty of group tours to the Royal Tombs of Vergina and the archaeological site of Aigai. Many day tours from Thessaloniki will visit Vergina and Pella on the same day, because they are historically so related and close (about 55 km) to each other. Map that shows the route and distance from Vergina to Pella. ⟹ Land of Alexander and Aristotle Tour will take you to the most important historical places of the ancient Kingdom of Macedonia. You will visit Vergina, Pella, Dion, Amphipolis and more places during a small group tour of 8 days. You can download a brochure with more information about this historical tour.